Rack For Petri Dishes is a clear acrylic construction with white Polycarbonate Posts. It has a capacity to hold 60 petri dishes of 90 mm size. This rack is very useful during inoculation, incubation & Storage. Visibility from all sides enables the culture to be seen & checked during incubation. Petri Dish is made of Polymethyl Mathacrylate & Polycarbonate. 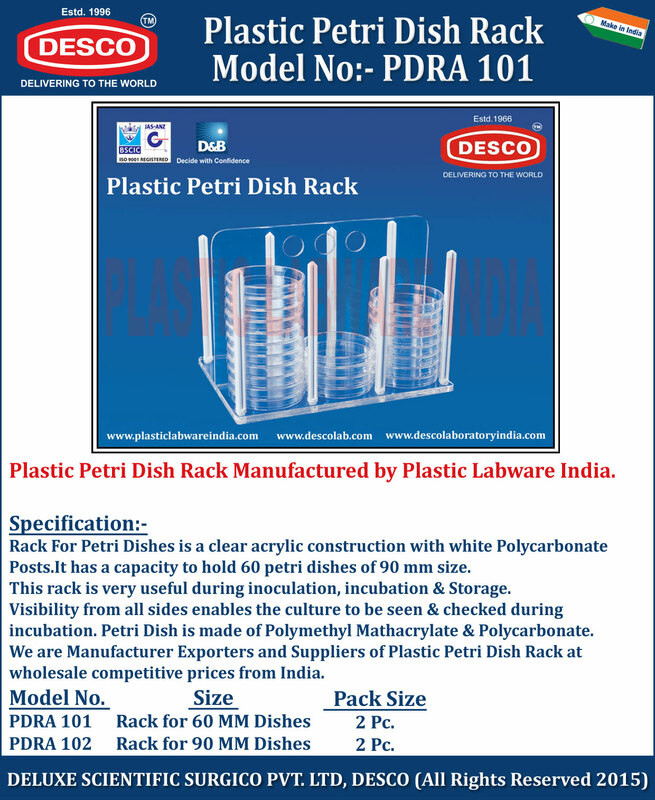 We are Manufacturer Exporters and Suppliers of Plastic Petri Dish Rack at wholesale competitive prices from India. PDRA 101 Rack for 60 MM Dishes 2 Pc. PDRA 102 Rack for 90 MM Dishes 2 Pc.